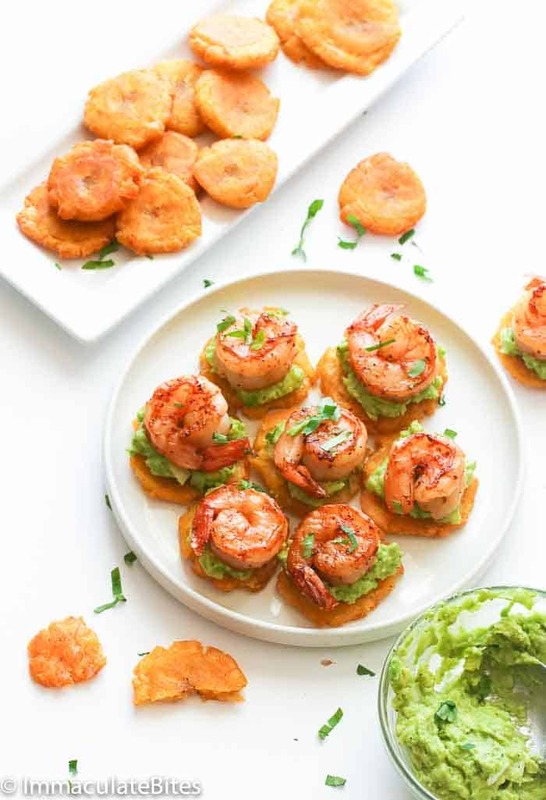 Tostones – Puerto Rican twice-fried plantains with a crispy exterior and soft interior paired with seasoned shrimps and pineapple guacamole.Powerful flavors come together to create an explosion of flavor in your mouth. One bite, and you are hooked for LIFE! Every time I had a meal with plantains served on the side, as a main dish or an appetizer, I am a whole lot happier. 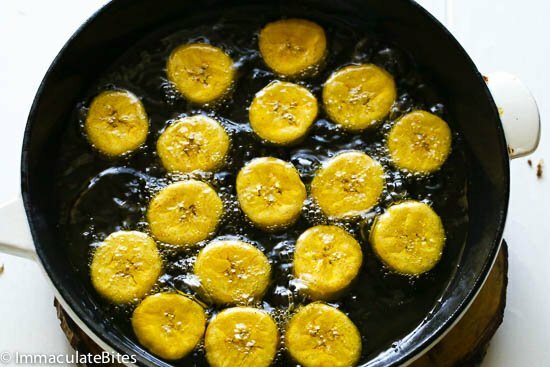 Fried plantains that are sweet or slightly sweet is my weakness – I just can’t keep my hands off of it! If I had a magic wand I would make plantains the healthiest fruit in the universe, until then… I will eat it in moderation. You need to start cutting off the ends of the plantain and discard the tips. Then hold the plantain firmly and slit the peel along the length of the plantain using the tip of the knife. Remember that you only need to cut as deep as the peel itself. So, control my friends. You gotta control! 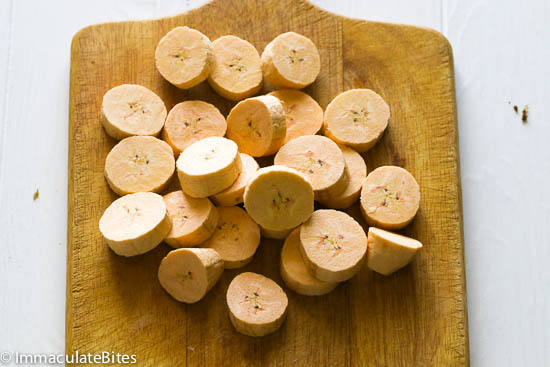 Finally, remove the plantain and cut them into thick round shapes. Easy, right? 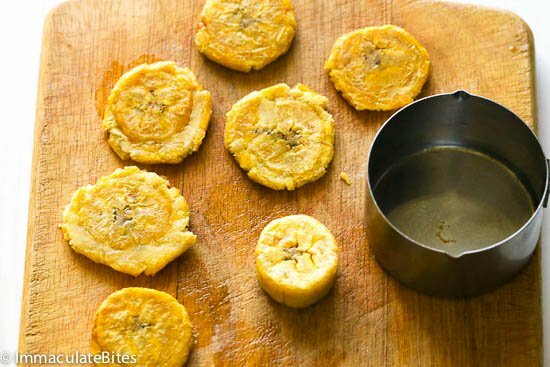 Now you know how to peel plantains, let’s talk more about it. Shall we? 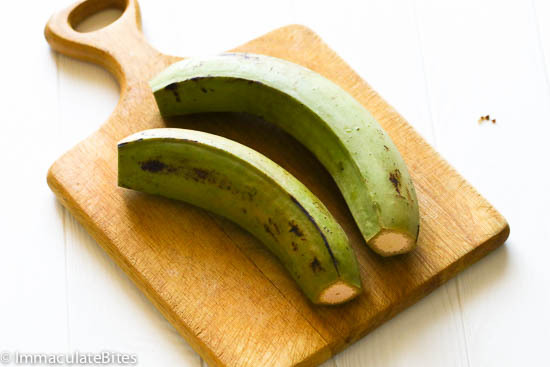 Plantain is a starchy, wholesome fruit that is a staple food in so many parts of the world particularly in places like Africa, Caribbean, South America, Latin America and India. It’s pretty popular. They are very versatile because they can be eaten sweet or savory. You can basically add them on almost anything. Trust me! 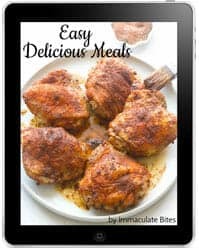 I have over 30 recipes here with plantains. Perhaps, that is also why some would consider it as veggie since plantains are added even on main dishes and treated as vegetables -Nah! In my books it’s a starchy side . 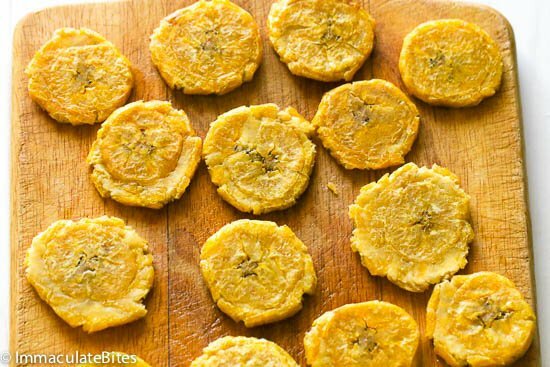 With all the plantain recipes, here’s one of the popular ways it is prepared in Puerto Rico and other parts of the Island , Central and South America. They are fried not once but TWICE! Why? To get a super crispy exterior and soft interior .
. But all the goodness doesn’t just end there. 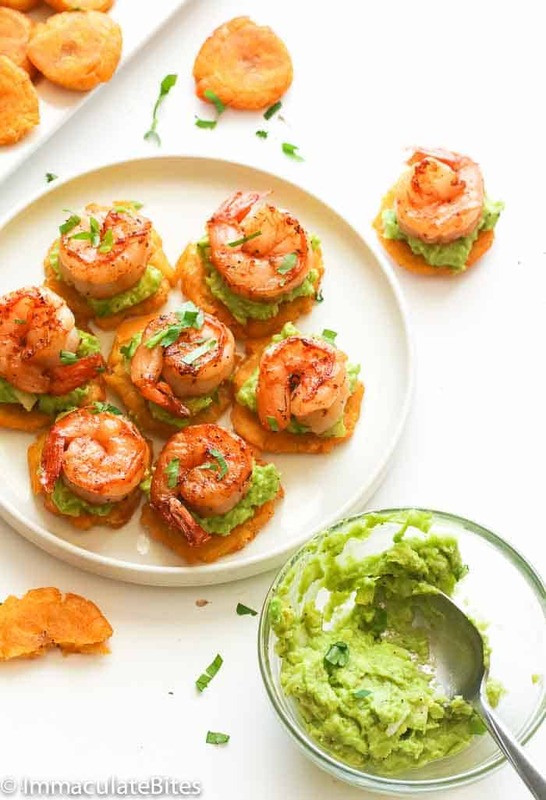 For a more appealing meal, I topped the tostones with Seasoned shrimps (my kind of shrimps.. 😉 ) and a burst of pineapple guacamole for a perfect blend of texture. Your mouth is going to Sing with JOY! 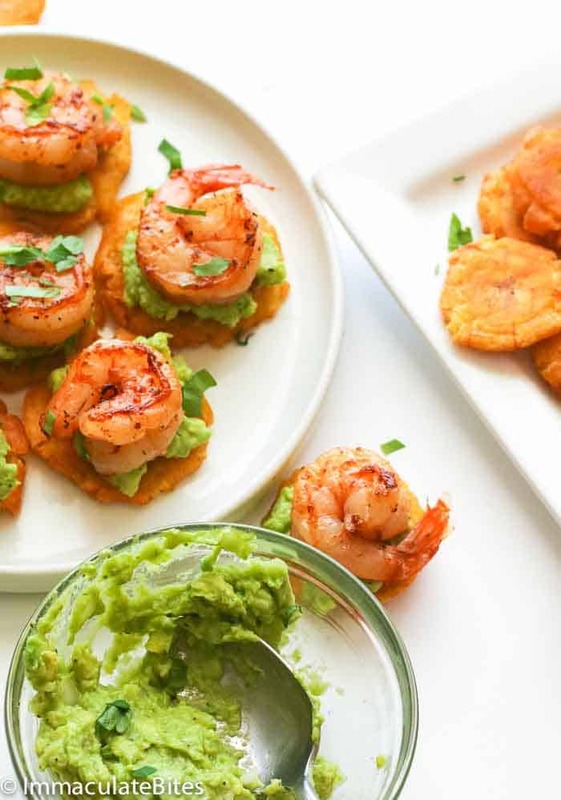 No rocket science in cooking these gorgeous-looking shrimps. 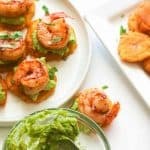 Just season it with your favorite seasonings , I used my all-around Creole Cajun Seasoning here to add boldness and flavor to these shrimps. You decide. For the guacamole, if you can get hold of fresh pineapples, the better. Fresh pineapples has the sweetest and freshest juice compared to packed or canned ones. 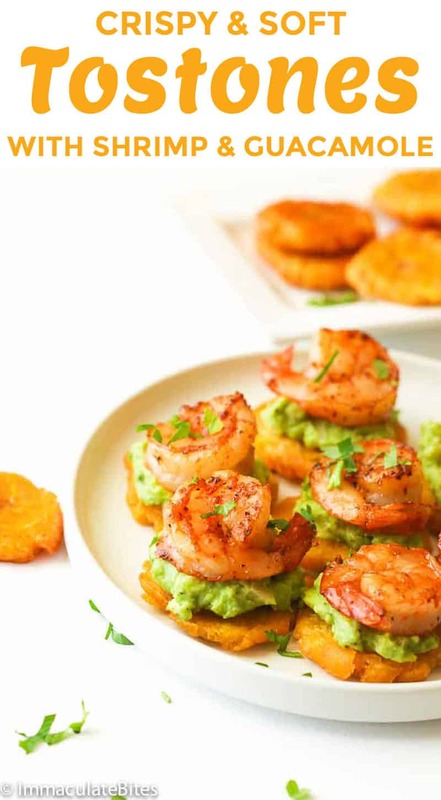 But either way, this pineapple guacamole blends well with the seasoned shrimps and the savory plantains. 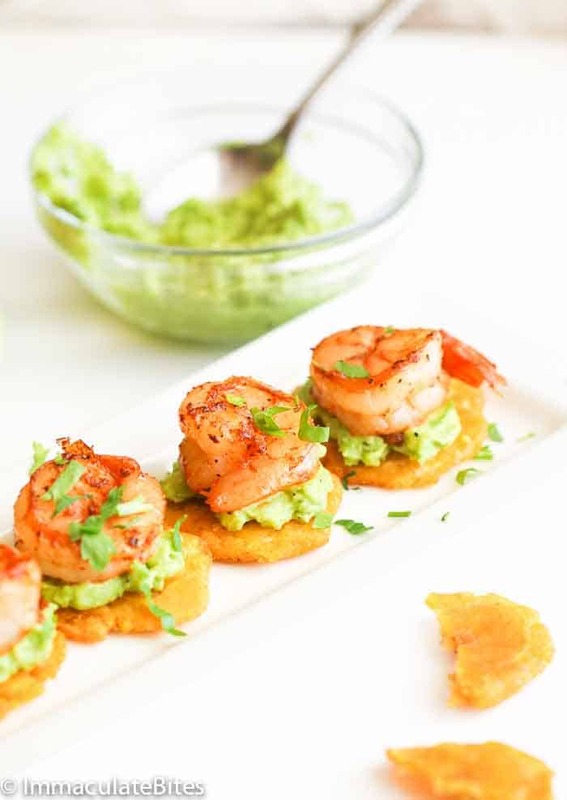 IF you are a guacamole purist leave out the the pineapple it’s still amazing without it . Tried both versions and it works as well. Once you serve these to your guest they are not going to want to leave your house – Seriously. Totally a crowd-pleaser , perfect for entertaining , parties and game day ! If you don’t have those digital kitchen thermometer, you can test the heat by flicking a tiny bit of a plantain into the oil. If it bubbles immediately, you’re good to go. Do not overcrowd the pan and instead cook them in batches. 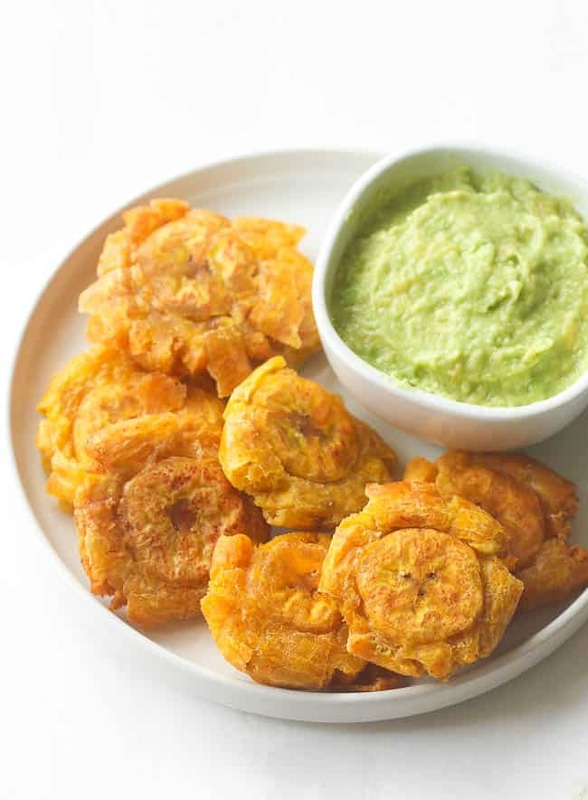 Fried Plantains with a crispy exterior and soft interior – Fried twice Plantains paired with pineapple guacamole. Mash with a fork until you have a smooth and chunky texture. Add lime juice, jalapeño, cumin, onion, garlic, cilantro leaves, salt and mix gently. 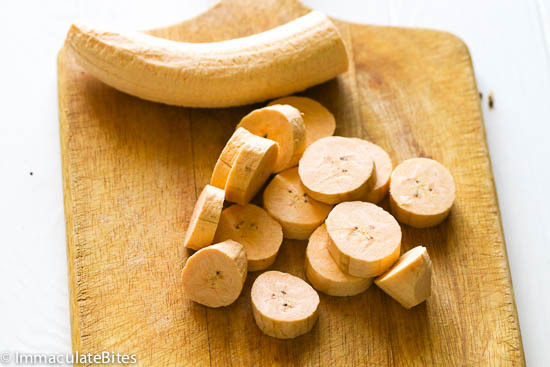 Cut the plantains into about 4 -5 thick round shapes. In a large, sauce pan pour vegetable oil, until it is at least 3 inches (or about 5 centimeters) high, place on medium heat until oil is 375 degrees. 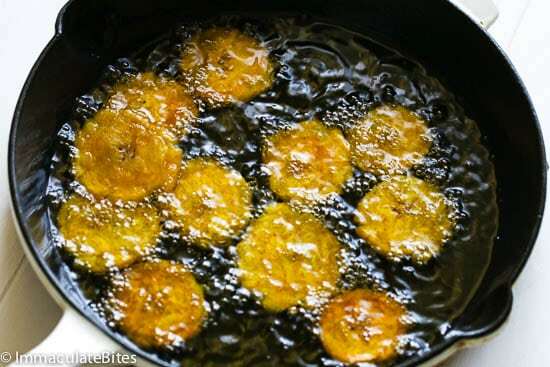 Gentle drop the plantain into the oil. Do not overcrowd the pan. Do so in batches. 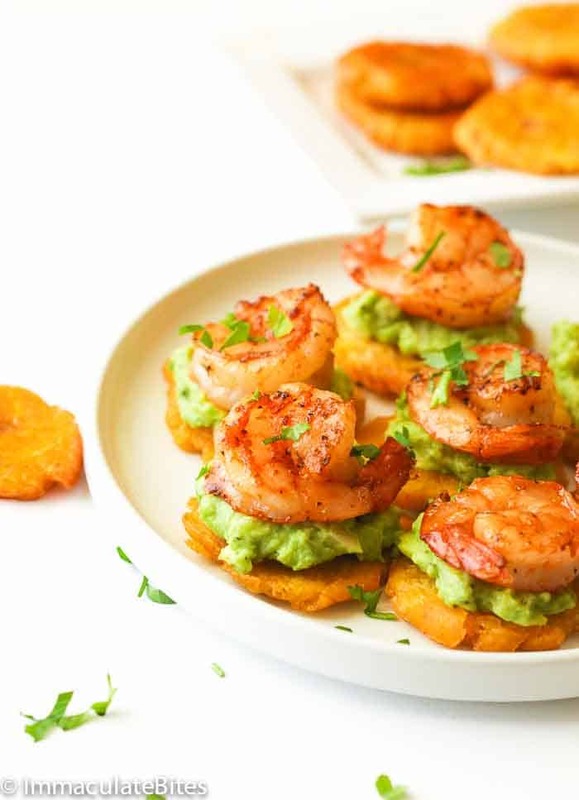 Place tostones on a chopping board or flat surface, and press down on it firmly with the back of a heavy plate, bottle or skillet until flattened to about 1/4-inch thick. Repeat with the remaining slices. Generously season the shrimp with creole spice or your favorite seasoning . Heat about 2 Tablespoons of oil over medium heat in a heavy bottomed Dutch or skillet. Sauté for about 5 minutes shrimp set aside. Originally posted in October 2013, this recipe has been updated with new photos, pictures and ingredients . Do you mean unripe bananas? If so, yes you can. This sounds amazing! I can’t wait to try this out. thanks for sharing! Looking forward to hear your thoughts on this, Melissa. Thanks for stopping by! I prepared them for a BBQ and they were a hit! You definitely need to make them close to the time you want to serve them though. Glad I tried them!